A lot of people tell me they won’t do a triathlon because they fear the swim. Sure, many of us learned to swim at an early age, but we still fear that one might not stay afloat for a substantial length of time, in an open body of water, surrounded by hundreds of other bodies (alive ones, yes), to boot. It’s a little off-putting at first, and maybe the panic has already set in, but I’ll tell you it simply takes time and practice. At my first sprint tri back in June of 2013, I emerged into the water when the horn went off, diving in with excitement to get the 500m swim started. Within one minute, another young woman in my wave (there were about 100 of us that started at the same time) kicked me in the face with her foot and immediately I felt like I was sinking. My heart was beating at the speed of light and I couldn’t catch my breath…I couldn’t swim. There wasn’t any support on that lake…no lifeguards on kayaks, no buoys to grab onto, and the water too deep to stand. I was just going to have to figure this one out on my own. Luckily for the wetsuits, we float. Luckily for my training, I remembered to turn onto my back. I did just that and breathed out into the sky, praying that the clouds would help push me to that swim finish. I never got back to normal on that lake, so I backstroked my way to the beach and thanked the heavens that I didn’t die out there on that body of water. Yes, very dramatic, I know. But in that moment, I really thought that was it for me. I also vowed to NEVER DO TRIATHLONS AGAIN! Many swim practices later, and after a close bond built with my wetsuit, I can now tell you that I LOVE SWIMMING. It has become the only leg of triathlon that I actually look forward to. I find that swimming is the easing into the race. From a far, it looks chaotic and all you see is a sea full of colored caps and flying arms and legs, but if you can learn to get in your zone and mind your own, you will go far, literally. *Know Before You Go….you must understand that a pool is nothing like an open body of water. A controlled body of chlorine water will be a great resource for stroke practice, but doing open water practice swims ahead of your event is key. The splashing, wave crashing, anxious environment of an ocean, river, or lake is one you may not imagine until you try it. A few dips and drills before race day will get you prepared both physically and mentally. Nothing new on race day, right? Right. *Get Your Gear Set…what you wear during your swim is crucial. Your wetsuit isn’t going to be easy to put on; it’s supposed to be snug. Make sure you stick with a style that’s comfortable yet efficient. Your goggles should be air tight, have strong straps, and not reflect any weird light. Plus, you’ll always need to have a backup pair. Goggles are said to be the most common misplaced or broken item at most swim start areas on race day. Make sure you do practice swims with all of your gear on…wetsuit included! Don’t be ashamed to take that Xterra for a test ride in the pool. Wave your newbie flag high and proud. *Don’t Get Caught Up in the Pack…if you feel you’re not the best swimmer or you prefer to stay clear of a kicking to the face, then hang back when that horn blows. Starting at the back of the group will keep your nerves calm as you enter the water at your own speed and ease in. Every time I start in the back, I end up passing those that started off too strong. Just like a running race, start steady and finish strong. That's how you really win a race. *Practice Sighting…that would be the act of looking up as you swim! It’s so important that you remember to pay attention to your surroundings during an open water swim to avoid going in the wrong direction (eek! ), bumping into another swimmer (ouch! ), or missing any important distance markers (shucks!) By sighting, you will have great awareness which leads to less panic and a smoother, faster swim time. Plus, if you see a shark you'll know to SWIM FAST! hehe, jk, jk. *Stick With What Works…you may recite mantras or hum songs while you swim, and that’s A OK. I used to blow bubbles to “row, row, row your boat” in open water swim races, and now I seem to daze off and think about life. But if there’s a routine that has worked for you, you better hold on tight. We are creatures of habit and in rough situations like an open body of water, you want to get that heart rate down the only way you know how to. *Stay Calm...aside from reciting your race day mantras, you need to remember this is just a race. Your health and safety is always the most important factor of the day. If you feel discomfort or can't breathe, either roll on your back and float or signal for help. Most races have assistance on the water and you should never feel too proud to wave them down. They're there to protect you and keep you moving forward. Listen to your heart; it always knows what's up. Though my sprained ankle has kept me from training too hard, I still have been exercising every day. Now, with 20 days till Ironman Mont Tremblant, I am once again giving up running so my ankle can properly heal. 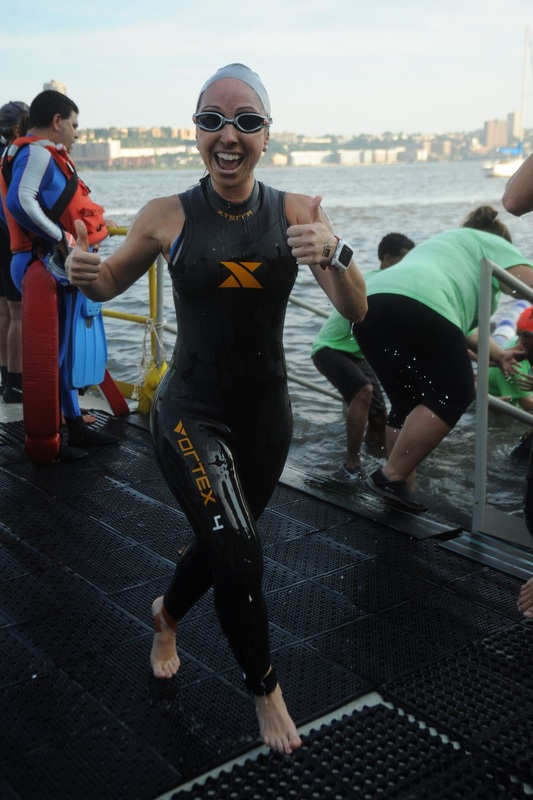 Heck, I even switched my NYC Triathlon entry to a relay last weekend so that I could just do the swim leg in the Hudson River. (which was awesome by the way!!) I will have some bike time in the next two weeks, but mainly long swims. Yay swims! Won’t you join me? I promise I will do whatever it takes to convince you that swimming is AWESOME!